In English, the term villa can mean any varying size residence or property nowadays. Though it often refers to a secondary, vacation, or country property. The term is used more so in Europe and Australia than it is in North America. 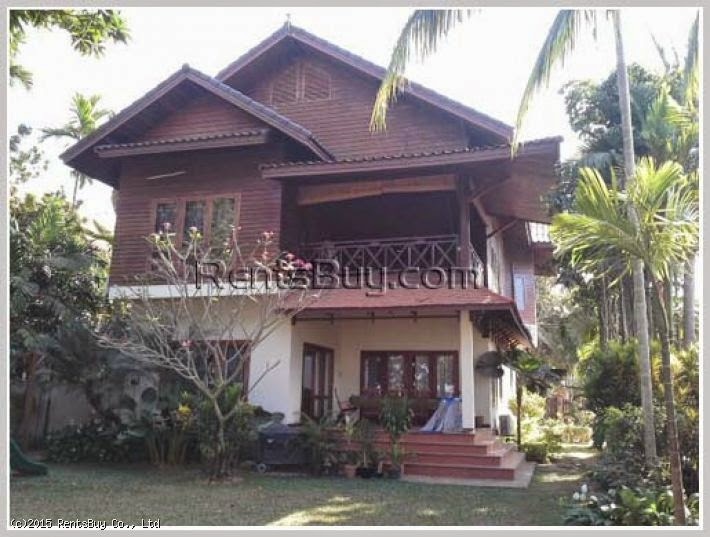 Photo Credit: Rentsbuy - an example of 2 floor villa. In Laos, this term broadly refers to any Western style home. Or in other words, homes that are not in the traditional Lao style. More commonly Lao homes are made of wood and concrete whereas before they were made entirely of wood. They often have a portion or are entirely raised off the ground. This is for practical reasons such as flood protection, keeping the house cooler, and being able to utilize the space underneath for other purposes. By comparison, the western "villa" in Laos is often characterized as made entirely of concrete painted white, with colored tile roofing, exterior columns or pillars in the front, with the entire foundation of the home entirely on the ground. They're very easy to point out as you drive around any Lao city.